In Microsoft Word 2016, you can change the keyboard shortcuts. A keyboard shortcut is a combination of keys that you press to give a command. For example, pressing Ctrl+P opens the Print window; pressing Ctrl+S gives the Save command. If you don’t like a keyboard shortcut in Word, you can change it and invent a keyboard shortcut of your own. You can also assign keyboard shortcuts to symbols, macros, fonts, building blocks, and styles. On the File tab, choose Options. You see the Word Options dialog box. Go to the Customize Ribbon category. Click the Customize button (you can find it at the bottom of the dialog box next to the words “Keyboard Shortcuts”). You see the Customize Keyboard dialog box, as shown here. Assigning keyboard shortcuts to Word commands. In the Categories list, choose the category with the command to which you want to assign the keyboard shortcut. At the bottom of the list are the Macros, Fonts, Building Blocks, Styles, and Common Symbols categories. Choose the command name, macro, font, building block, style, or symbol name in the Commands list. In the Press New Shortcut Key box, type the keyboard shortcut. Press the actual keys. For example, if the shortcut is Ctrl+8, press the Ctrl key and the 8 key — don’t type out C-t-r-l- +8. If you try to assign a shortcut that has already been assigned, the words “Currently assigned to” and a command name appear below the Current Keys box. You can override the preassigned keyboard assignment by entering a keyboard assignment of your own. If you want the keyboard shortcut changes you make to apply to the document you’re working on, not to all documents created with the template you’re working with, open the Save Changes In drop-down list and choose your document’s name. 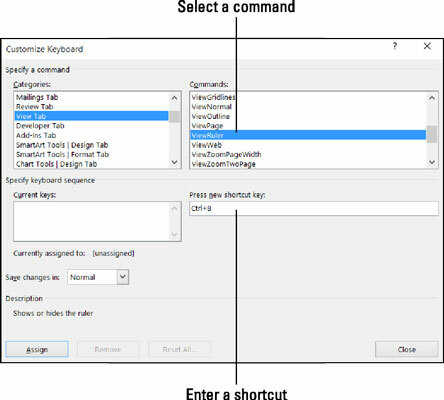 When you finish assigning keyboard shortcuts, close the Customize Keyboard dialog box. To delete a keyboard shortcut, display it in the Current Keys box, select it, and click the Remove button. You can always get the old keyboard shortcuts back by clicking the Reset All button in the Customize Keyboard dialog box.